Available as a supplement to the curriculum is daily Copywork and Activity book to go along with the lessons. The copywork includes both manuscript and cursive. This is an ebook, which you download and print immediately, giving you the option to only print the pages that you need. 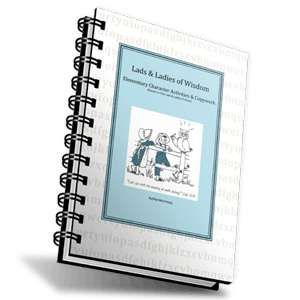 Available as a supplement to the lads & Ladies of Wisdom Character Curriculum is this daily Copywork and Activity book to go along with the lessons. The copywork includes both manuscript and cursive. Each day the student will copy the memory verse, and the KEYS for each lesson. This will give them handwriting practice, while also helping to reinforce what they are learning in the daily lessons. Also included are additional fun activities for the kids to do, like word search puzzles, crossword puzzles, match-ups, and word scrambles. CLICK HERE to download a sample from the copywork and activities book. One other thing you can do is tell her that at the end of her copywork time that day you will select one or two words from the passage and ask her how to spell them. Nothing high pressure or elaborate; she can spell them orally or write them; but just encourage her to cultivate that new habit, and it will serve her well when she starts Spelling Wisdom and for the rest of her life. Kathy does an excellent job at creating materials to benefit the whole family and bring everyone closer to God. 5 stars for Kathy!